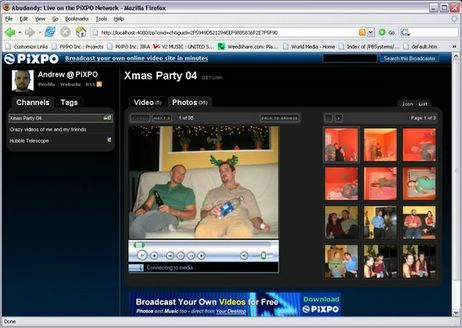 PixPO is free desktop broadcasting service for sharing digital videos and pictures from your PC. Unlike YouTube or Flickr where you first upload content, PixPO runs directly from your computer, with no uploads required. Getting started with PixPO is very easy. You begin by installing a small 4.5 MB PixPO client on your computer. Then create a new channel and add digital videos, audio files and photographs that you intend to share with the outside world. The software will automatically generate channel link, relevant tags and RSS feeds for you. Send the channel link to your friends and they can watch exactly what you want them to see. It's like creating your personal TV channel with your own media content. PixPO uses a peer-to-web technology to broadcast your media through the PiXPO servers directly to the web.